like she was born to do it. knuckles sad around his stout. he is colorblind, "for an Irishman"
seems green enough to grow. she uses to reprimand the cat. to every meal she cooks. She dabs it behind her ears. 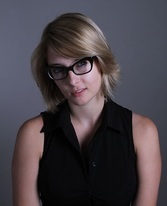 Meghann Plunkett is a New York City based writer and performer. Her work has been published in national and international literary magazines including Simon & Schuster’s new anthology, Chours. She is a co-founder, producer and performer for the show KissPunchPoem: an official selection at the Chicago Improv Festival, the New York City Poetry Festival, the Hawaii Improv Festival and the Boston Comedy Arts Festival. The show has also been featured at The Encyclopedia Show and The Green Mill in Chicago. She invites you to The Magnet Theater in New York City, every Saturday at 9pm.